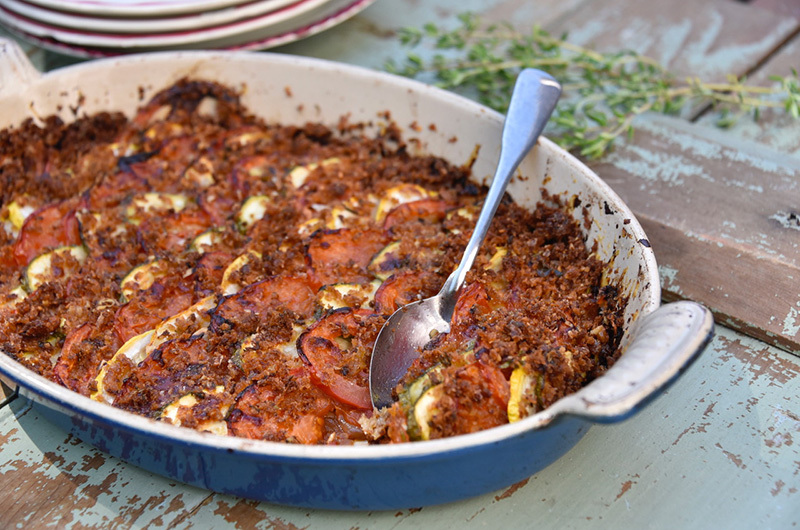 This tian (a Provencal gratin) has a lovely base of sautéed onions and bell peppers hiding underneath rows of tomatoes and summer squash. Cook the gratin long enough to reduce the juices; the crunchy top will be deeply golden. Let cool a bit before serving; leftovers are delicious. Recipe by Susie Middleton, adapted from The Fresh and Green Table (Chronicle Books, 2012). Preheat the oven to 375 degrees F. Rub a shallow 2-quart baking dish with a little olive oil. In a small bowl, combine the bread crumbs, 2 tablespoons of the Parmigiano, 1/2 teaspoon of the thyme, and 2 teaspoons of the olive oil. Mix well. Whisk together the balsamic vinegar, the honey, 2 tablespoons of olive oil, and 1/4 teaspoon salt. Put the squash slices in one bowl and the tomato slices in another. Add a pinch of salt and 1 teaspooon thyme to each bowl, and drizzle half of the balsamic mixture over each. Toss gently. Let sit while you prepare the rest of the recipe. In a medium (10-inch) heavy nonstick skillet, heat 1 tablespoon of the olive oil over medium heat. Add the onions, the peppers, and 1/4 teaspoon salt. Cook, stirring frequently, until the peppers are limp and the onions are golden brown, about 10 to 12 minutes. Stir in the minced garlic and cook until softened, about 30 seconds. Transfer the onions and peppers to the baking dish and spread them evenly in one layer across the bottom. Let cool slightly. Sprinkle the sundried tomatoes and the remaining 1/2 teaspoon of the thyme over the veggies. Starting at one end of the baking dish, arrange a row of tomato slices, slightly overlapping each other, propped up against the end of the dish at a bit of an angle. Sprinkle a little Parmigiano over the row of tomatoes, and then arrange a row of zucchini slices, slightly overlapping each other and slightly overlapping the row of tomatoes. Again sprinkle Parmigiano on that row, and continue to arrange rows of tomatoes and zucchini, each sprinkled with Parmigiano, until you get to the end of the dish. You should have just about the right amount of zucchini, but don’t worry if you have extra slices. You will definitely have extra tomato slices (some will have fallen apart! ), but as you are going along, if it looks like you will have a lot of extra, gently push the rows back up towards the end of the dish to make room for a few more rows. Scrape any remaining seasoning and juices from the bowls over the veggies. Sprinkle any remaining Parmigiano over the veggies and drizzle with the remaining 2 tablespoons of olive oil. Top with the bread crumb mixture. Bake until well browned all over and the juices have bubbled for a while and reduced considerably, about 60 to 65 minutes. Let cool at least 15 minutes before serving. This recipe first appeared with this story.